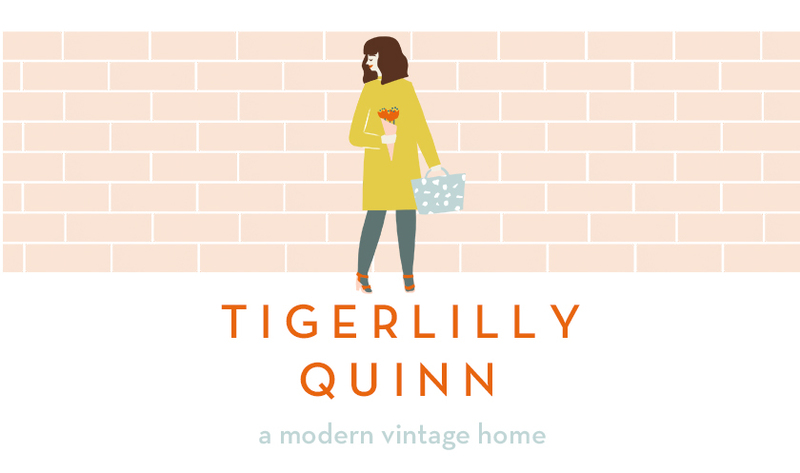 Tigerlilly Quinn: TSB & Dulux 'Amazing Space' Win two thousand pounds to spend on yours! TSB & Dulux 'Amazing Space' Win two thousand pounds to spend on yours! A couple of weeks ago the team at TSB got in touch to share with me their latest collaboration with Dulux and have commissioned me to mention this exciting new offer with you guys. As part of a current promotion anyone taking out a home improvement loan with TSB will also be able to use the Dulux 'Amazing Spaces' feature (worth £75) to have a one on one consultation about what to do with their space to make it perfect for them. Don't forget to head to the bottom of this post to find out how to win two thousand pounds to spend in your home! 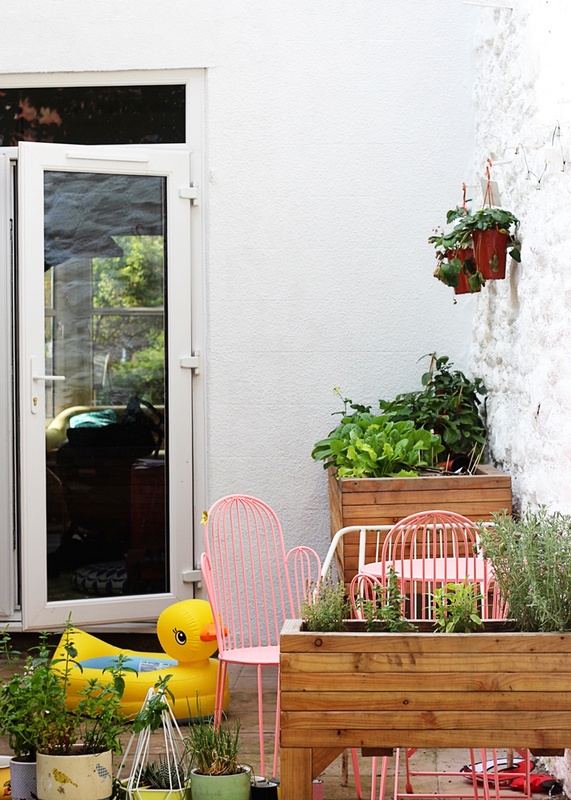 You can also see some more photos of our home transformation over here. As many of you know we've been working on our home in bits and pieces since we bought it as a project about six years ago now. At the time we both had hardly any money and so our budget was tight and things took a long time to happen. A lot of the work was big jobs such a building walls or knocking them down and putting in french doors to our garden. 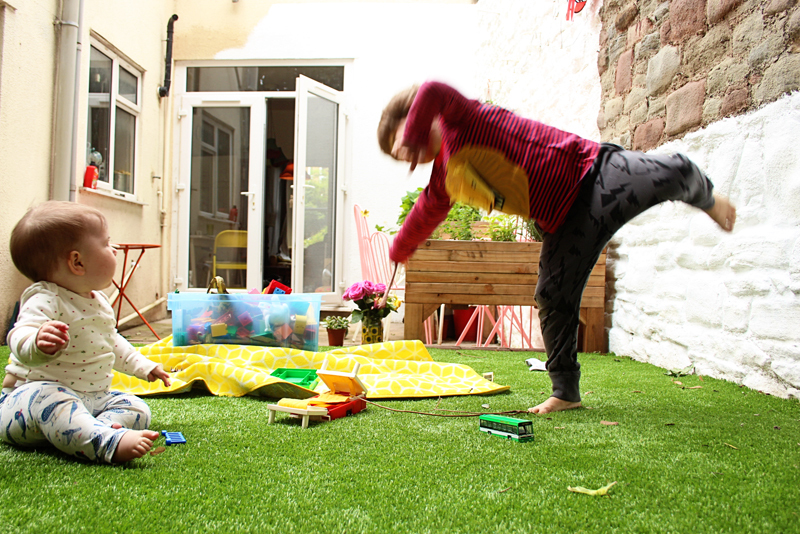 Our garden actually has only really come about this year when we were finally able to afford to put fake grass down and tidy it up a bit to make it a manageable space for our family. All our home improvements feel really personal as they are things we've really put our stamp on and to see our family home grow in this way has been so rewarding. Thats not to say it hasn't actually been pretty frustrating at times too as we waited to save the funds to complete them. Some of the projects were quite big and did need the money behind them before we could really start the work but some of our projects I wish we'd done quicker so we could have enjoyed our space sooner. Our living/dinning room is prime example of that really as adding french doors made such a huge difference that it's one of those things I wish we'd taken out a small home loan for to make use of it sooner and pay it back over that time period instead. 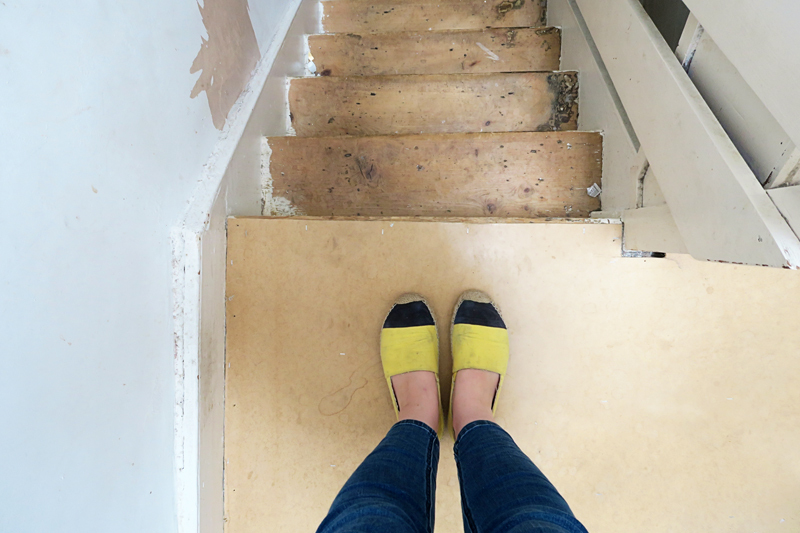 I don't think I've ever shared these pictures on the blog before but this is what our house looked like when we bought it (yikes!). As you can see the living room was pretty laid out pretty oddly, there were actually two different levels to the rooms and then a small window at the back and a odd sort of arch where they had made them into one big room. We initially re-concreted the floor to make it the same level and then put floor boards down instead of laminate. We also took away the fake fireplaces and re-painted but thats where we ran out of budget. About five years later we did the renovations below which included adding french doors and closing off the rooms with partition doors and adding a stud wall. The french door part cost around two thousand pounds as did the wall and doors between the two. I really wish we'd done the french doors straight away and paid it back over time. This is what it looks like now, I think the doors make such a difference. As you can see we've really put our own stamp on the space and it really feels like 'us'. The garden wall is *almost* finished painting at the top there ha! 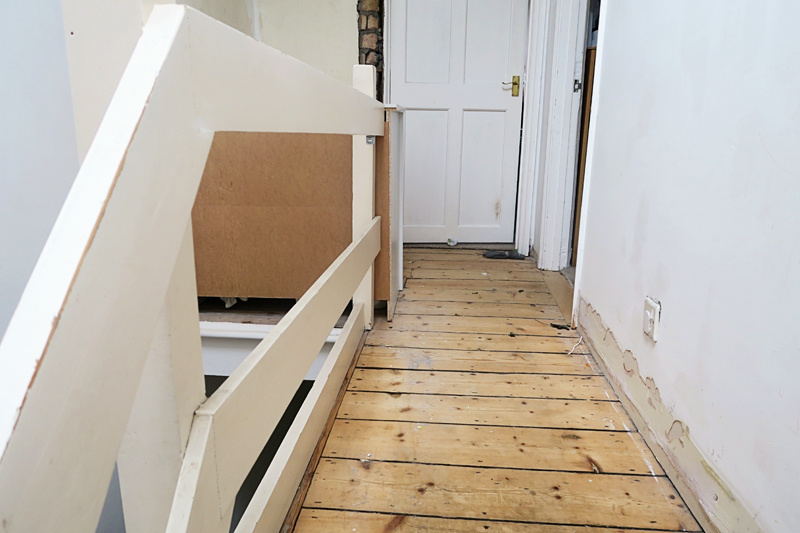 A couple of months ago we decided to strip out the carpet I hated on the stairs and hallway and also knock down a inbuilt wardrobe that sat on the top of the landing. By knocking it down it made the space so much lighter and has given us some room to play around with. I wasn't 100% sure what would work best there and what colour schemes we should go for either. We're about to get it plastered and then will play around with paint and colours which is where the Dulux Amazing Spaces service comes in. Funny enough the cost to transform this space will come in just under two thousand pounds which I think it just the sort of budget that you often don't have to hand but is sometimes easier to borrow and pay back over the year. This is what it currently what it looks like (it's about to be plastered so use your imagination when it comes to the brick wall!). After I'd sent my pictures to the team at Dulux and told them a little about my space, the colours I like and the example pictures they showed me that I felt drawn to the team there were able to go away and take a look and come up with a plan for me. My consultation took place over video call two days later and I loved the ideas and colour schemes they pulled together for me. I felt like they'd really understood my personality and had done the research really well to come up with some things I felt were my style but also some things I would never had thought of but immediately loved. Take a look at the plan and products they drew up for me, it's making me so excited to get this space finished! Here comes the part I've been dying to share with you guys! When I started chatting to the team at TSB & Dulux about this collaboration and they told me I'd be able to host an amazing giveaway with my readers I was so excited. It really is a brilliant prize and one thats extremely easy to enter. TSB and Dulux are going to be giving away an Dulux Amazing Space Service and £2,000 worth of furniture and accessories (as chosen for the winner by the Dulux Designer) to sure that they can have an amazing space of their own. To enter all you need to do it check out the TSB collaboration with Dulux here then come back and let me know in the comments what you'd spend your two thousand pounds on in your home. Full terms and conditions can be found here*. Additional entries can be made after the above is completed by retweeting my tweet and also by tweeting using the hashtag #HomeImprovementHeroes. You can also gain additional entries by following on Instagram and Twitter and visiting the FB pages of both companies. The rafflecopter widget will record your visits and tweets and count them as additional entries but the only mandatory entry is the one commenting below this post on what you would do with two thousand pounds. Of course feel free to enter as many additional entries as you like to increase your chances of wining once you've completed the mandatory entry! Winners will be pick at random using the Rafflecopter widget from all valid entries made before 23rd September. I'd love to make my dining room into an amazing child friendly space it's so boring and more like a junk room! I would love to turn our cottage kitchen into a prettier more functional space. It is the first room you walk into and I find it a constant battle to make it look smart, tidy, inspiring and inspiring. I love kitchens to be the heart of a home - especially now that I have a baby boy who I can't wait to cook for!! I would love to won this competition for my 17 year old daughter.Who is about to start her 2nd year of A levels.Her room is very small.And needs more storage and colour. She has worked so hard would be an amazing treat. My 8 year old's bedroom is very plain as we never got round to personalising it after reconfiguring the layout and having the walls replastered and painted cream. I find it really difficult to imagine designs especially for a girl who is entering the tweenage years, what I would pick is likely to be wrong so the Dulux Amazing Space Service would really help me out of this Mum dilemma. I desperately need their amazing help to blend all the colour clashing items in my 3 year old'son room! We are about to plaster and still haven't decided on colour, thanks to a bright green and yellow rug, and pastel pink tipi. Hell Hellllp! WOWZERS! I'd spend the money to make our boys' room fab, at the moment it has strange purple walls and the world's shonkiest built in wardrobe. 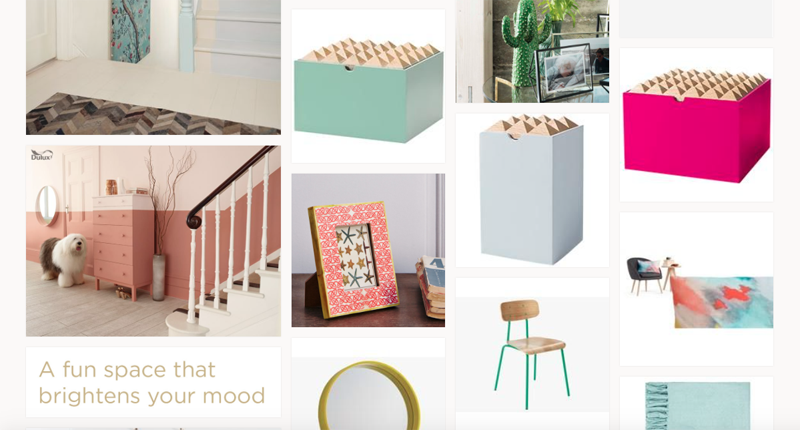 I'd love the space to be as fun as them with lots of useful storage, fingers crossed! We moved into a Victorian terrace two years ago but the previous owner had removed the lovely bay window and flattened out the brickwork. 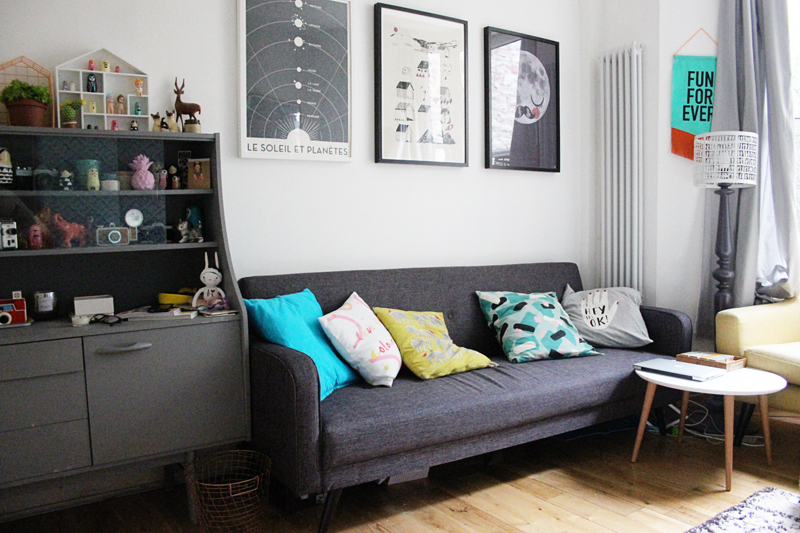 I would love to reinstate the bay to create more light and space in our living room! We just put fake grass down in our yard this year too. It's amazing the difference it makes. It's like having another room. It's only a small space but it makes a world of difference - fake grass really lends itself to the little gardens around here, right?! Wish we'd done it years ago! Great competition! I would definitely spend it on my boys bedroom. Since moving in over a year ago I haven't had the cash to spend. They have ended up with a room full of a mish mash of furniture and bits from their baby nurseries. They need a fun boys room right for a 4 and 6 year old. Your home is beautiful Fritha! Our journey has been similar to yours, doing little bits as we can afford to, to make our own space. I would actually also use the money for my hall and stairs too. We've ripped up the carpet and painted the floor, but unsure about the walls and furniture. We need to store books up there, but don't want something that takes up too much space. I'd also be keen on a bright painted mural that would work against our bright blue front door, so the inside is as cheery as the outside! This would be amazing! 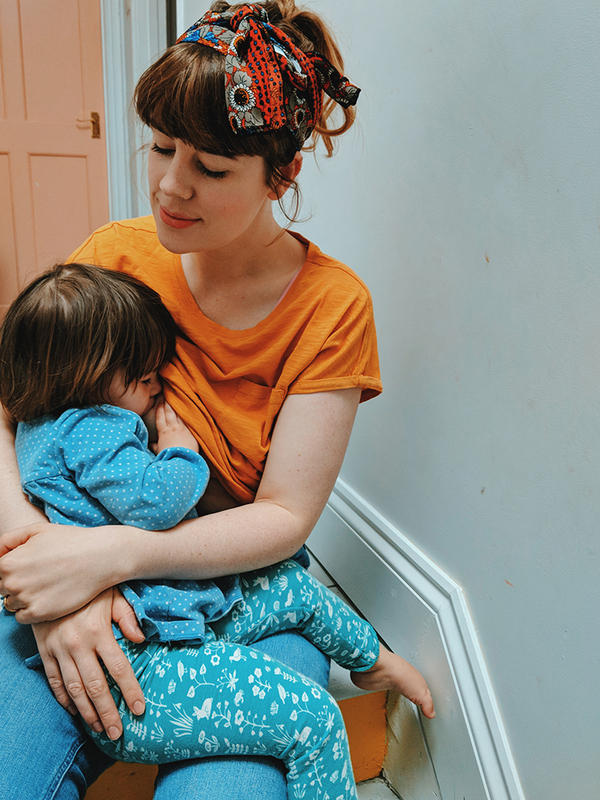 We moved into our house when I was 8 months pregnant and between buying a house and maternity leave funds are pretty tight to make any changes just now.. plus the baby takes up a huge amount of time! We have a room next to our garage that isn't currently connected to our house. I would live to get stairs down and connect that room up so it can be a nice place for family to stay and a space for my sewing things. I'd like to get more storage in my house... Hilariously probably the exact opposite of what you've done Fritha - I'd like built in cupboards at the top of my stairs!!! I would totally spend the money on maki a really sumptuous bedroom. I moved in to my house a year ago and absolutely everything needs redecorating (avocado bathroom suite with fitted shagpile carpet, 80s kitchen etc). We are prioritising the main rooms such as kitchen and bathroom and so won't be able to afford to do anything to our bedroom for years. I'd love a bit of extra money to properly do a room just for us. Oh wow those colours are lovely in the inspiration pic! I'd spend the money on our dining room, as it looks like a toy box exploded in there, (it's the only space we have to store toys), and every item of furniture (and most of the decorations) are second hand and a bit tatty really. It would be AMAZING to make it look pretty! This is absolutely phenominal! 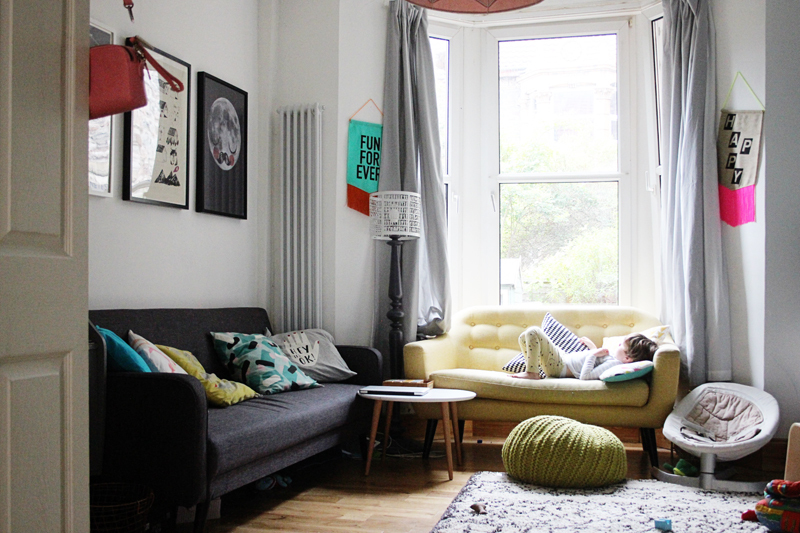 Your home looks beautiful by the way, what a lovely transformation you've made :) I'd love to be able to finally create my own personalised private space where I can focus on my work but also somewhere I can relax and unwind. I'd love to create a white and grey theme in my bedroom, with shelving and a desk space, along with wall art full of quotes to motivate me! Omg I love this post so much- it's got my creative juices flowing all over agin. We've had a long journey in such a short space with this house. my husband inherited after his mum passed away very suddenly, whilst we loved it it hasn't ever felt like ours. 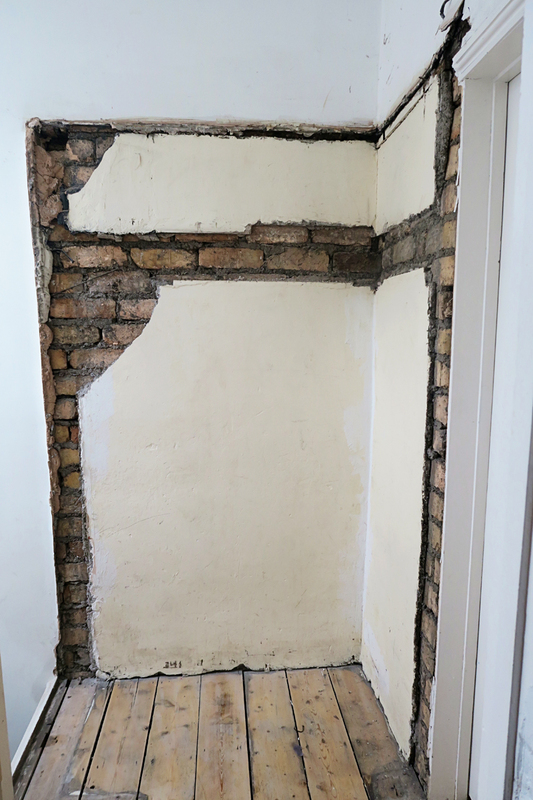 So we've taken the plunge to renovate it all- starting by treating the rising damp that's in all of the downstairs- £6000 later a whole new flooring, new walls, ripped of chip paper and plaster the damp is treated but our budget is now gone. We've got as far a white washing the walls, but would love to inject some life,colour and fun items we got from Bali and incorporate some others I've found in the good old charity shops of Bristol. :) here's to wishing - good luck everyone and don't forget that this decorating lark is meant to be fun :) keep smiling and happy Friday! I would like to turn the empty sad looking reception room into a bright, fun and functional playroom for my two small children. If I were lucky enough to win £2k I would finally get to redo our bathroom. 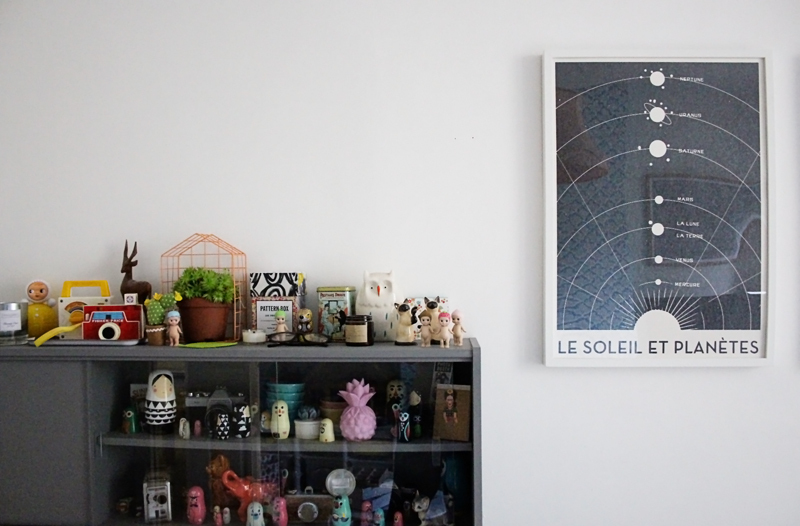 It's a tiny, soulless, outdated room that is the weak link in our home. It would actually change our lives I think, currently the shower is barely capable of doing it's job! Your home looks beauiful. 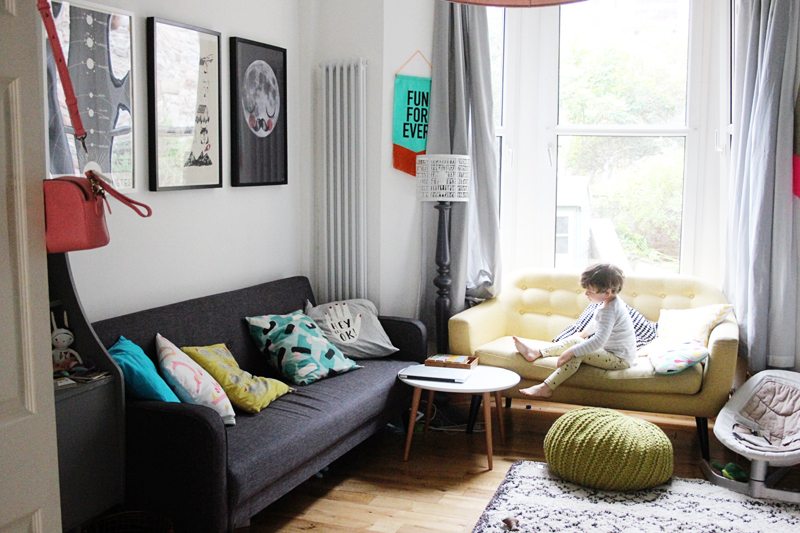 I'd love to transform our living room into somewhere cosy and relaxing that's not full of toy clutter! Our kitchen really needs a spruce, it's long, dark and dated. £2000 would enable us to change the work top repaint the cupboards, change the handles, put in new bright light fittings and paint. Our 'heart of the home' looks like it has heart disease 😂. Not great for baking with my five year old. At the moment we have a whole staircase 2 flights and my daughters room that needs done. My house has been a huge project and still is. The £2000 would give my daughter a dream princess bedroom that she keeps wishing for. I would use the 2k for mine and my children's bedrooms, they both look like storage rooms rather than some where relaxing, calm and restful. Half broken wardrobe doors and wonky draws is a no no and the bare white walls need a splash of life. Oh yes and the flower power carpet could go to. I would spend it redcorating our rooms and hoepfully invest in a new bed for me ! I would not spend on Chintz and lace. a place of comfort and tranquility. We're currently renovating our home, so I could pick any room but the kitchen (as that's the only one complete) but it would be fantastic to change my dining room from damp and dark to bright and beautiful. We are dying to turn our boring lounge I to a grownups-only cocktail lounge! Brass fixtures, a rolling bar cart, and some mid century modern chairs. We also want to paint the cream walls (blech) a deep, dark blue. Mmmmmm . . .
We are in the process of sealing the deal on our (hopefully) forever home at the moment. 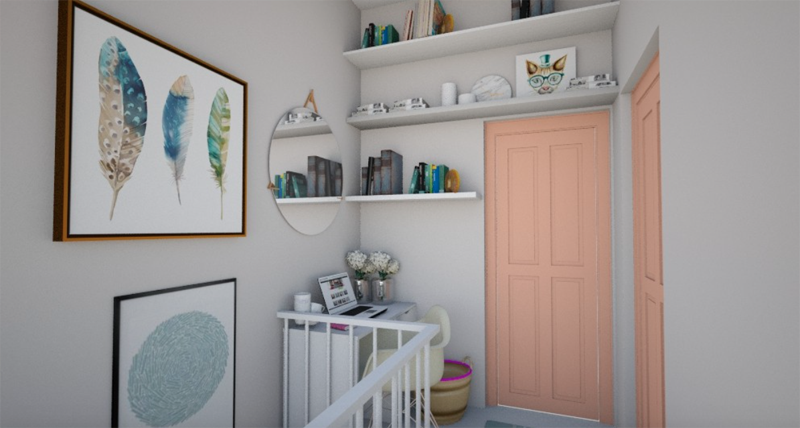 I would spend the £2,000 on my daughter's bedroom in the new house, to make it the best space it could possibly be and help her to feel settled in our new home. She is feeling quite unsettled by all the change coming up, and an amazing new bedroom would help her feel special again. I can see all sorts of fabulous colours, wonderful hidey holes for her treasures, dressing up corners, a princess canopy for her bed and amazing fabrics to complement the paintwork. Oh yes please, she would love it! I'd definitely use the winning for the kitchen! We'd so love to give it a revamp - it certainly needs it! We've lived here over a year and a half and it still doesn't feel like home so I'd use the money to buy all the things that would make it feel like our own. 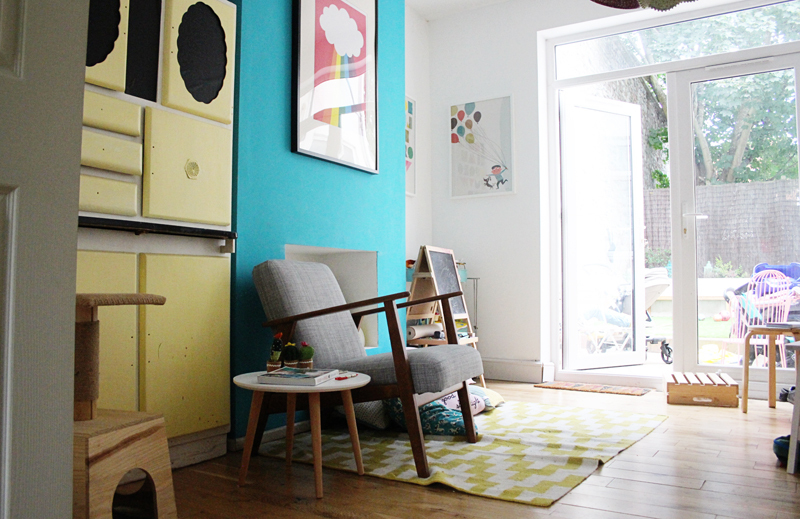 A sofa, wall art, rugs, lots of toy storage and I'd love to make the kids a little den under the stairs! We've lived in our little damp cottage for 12 years this month. Now married and three little children later we finally bit the bullet and essentially took the house apart to banish the damp and make our warm,solid and safe for our family. But with though comes the task.of putting it back together. We've tackled one room but there's still a few to go...the kids keep asking when we are going to make it "good again"
I would love to turn my girls room into a space they don't mind sharing. There own little bits of personality in two halves without actually splitting the room in half with a wall. If I won £2000 for a room, I'd use it on my bedroom. After years of cosleeping, breastfeeding, using it as a dumping ground/washing room, I'd finally create a space for me and my husband to have as an escape from the rest of a rather child orientated home. In fact when the kids are running riot around the house I'd use it as my own private living space when i need some time out. My eldest is 12, youngest is 3 and I think im ready to move on from child friendly bedroom to my own bedroom! We are doing a whole house renovation so £2000 would be very useful. I think it in particular I would use the £2000 to finish off the spare bedrooms so our families can stay with us. I would absolutely love to win this competition. I am currently renovating a house for my family and we are in the process of adding a large basement to the property. I have visions of an amazing family space and playroom. 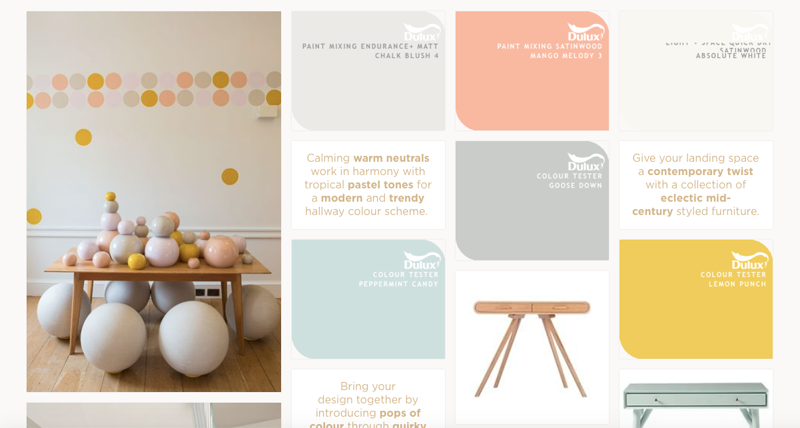 I'm so inspired by the Dulux collaboration and seeing what is possible to make an amazing space that can look incredible with bright colours, features and prints but also have practical and functional aspects. I'd love to finish our dining room we treated our selfs on buying the house getting a wood floor fitted, the fireplace knocked out and re plastered and painting but the furniture is still second hand or from our old flat so would love to get new stuff to be on our one nice room before getting the roof re done and new boiler later in the year. 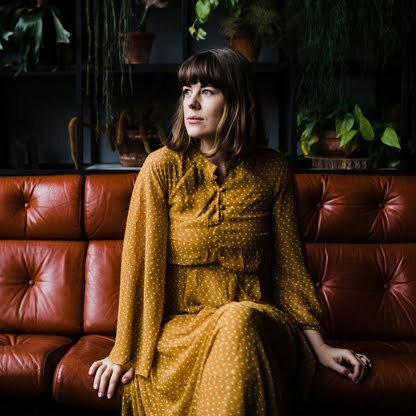 Rachel Isaacs. I love what you've done with your home Fritha. It always looks so happy and inviting. The garden is looking fab too! We've been doing our house up on a budget and would love to win to help it on it's way! The biggest jobs we still have to face are the kitchen and bathroom but one step at a time. What a great giveaway darling. So much you could do with these winnings. I am trying to convert our loft and design a nice open space for my office and play area for the kids. Love what you have done with your beautiful home and the colors are stunning. You are always so chic and trendy and your style choices are lovely. I've an open plan space upstairs which is an office / chilling space. I'd love more built in storage and to create a window seat. Also replace some of the existing furniture. Great blog and comp! Our back living room is currently a dining room/play room/sewing space. White walls, no door, lots of plastic storage boxes and and patio doors onto the garden. It needs some character, love and organisation. I would use the money to have our bathroom re done. Since buying our house, the shower has always leaked through the kitchen ceiling lights so we've never been able to use it and have to bath every day. I'd absolutely love to do up our bedroom. Aso parents were always last on the list and never seem to actually get around to getting our room sorted! 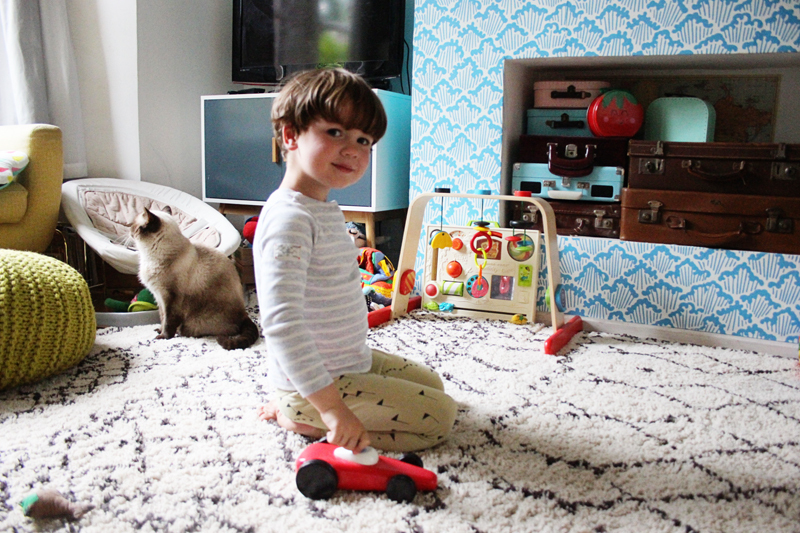 It's currently a delightful mish mash of hand me downs and shabby carpet! Haha. I'd love a vintage shabby chic look! Where to start! My bedroom in desperate need and also the kids play room and our spare room too! I have just moved into a new home with my boys, so my first priority is to make their room comfortable and fun. 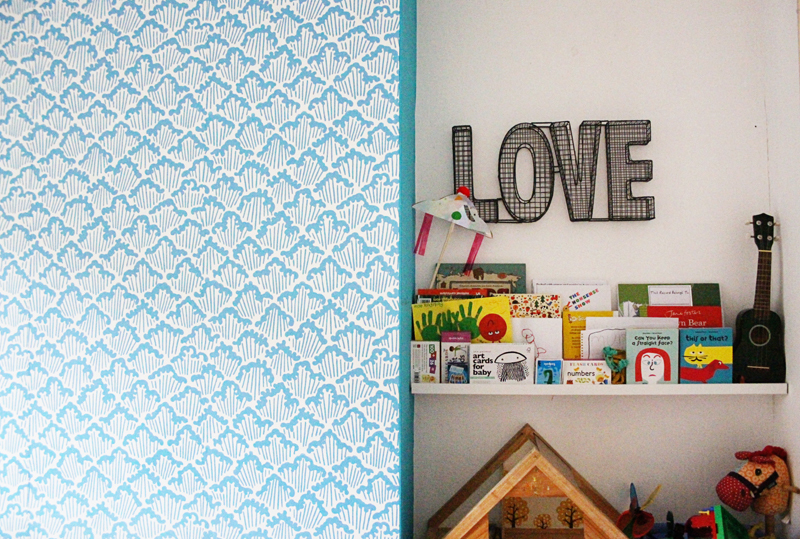 My daughter's bedroom was last decorated in the 70's by my mum. I would love to bring it up to date with a complete makeover. I would love to put the money towards converting our garage into a play room - allowing our living room to be freed of the kids toys and the clutter that they bring! I'd like to do something, anything (!) about our kitchen. The bare bones of it are ok I suppose. But it would really benefit from some new flooring, a new counter top and maybe a lick of paint. Oh also a new sink. Maybe some new cupboards. .. I need a new kitchen don't I. We would use it to create an amazing space for our daughter by redoing the second bedroom ready for her moving from her little nursery room. On an amazing kitchen and a huge dressing. We have outgrown our house and are planning an extension, so it would be amazing to help with the. Ew space! Honestly my bedroom I moved back in with my mum and dad to samce for a mortgage and I have odds and ends of furniture nothing really fit for purpose. I would def spend getting me & my husbands bedroom.we've lived in our house 10 years this year and it's the only room out of the whole house not to get more than 2 licks of paint in all that time. With 2 additions into the family setting up their rooms has been a priority so ours got delayed and forgotten. The romance and reconnecting needs injecting again into this room and this would be perfect. Deciding where to start is probably the hardest part but seeing it come together eventually is great. Love what you done with your place. I have 2 girls (aged 10 and 1) and I tend to find myself making sure their little spaces are fun and fit their needs but I haven't really had the time or funds to know where to start on my own bedroom. Its just me in it so I'm not sure why I find it difficult lol. I love my bed that's my newest purchase but my furniture just doesn't match. In fact iv had my bedroom furniture for waaay too long it was actually hand me downs from my mum and dad and if I was to guess how old they are id say older than my oldest daughter. My walls have that god awful bumpy wallpaper painted over with the bog standard magnolia. I also have my grandads cream leather chair in the corner which I wouldn't let my mum get rid of so it now sits in my bedroom. Id love to have a space of my own that I can retreat to that's not covered in toys and odds and ends. Somewhere I can say wow this is mines, relaxing and tasteful aswell as very durable for when my little one is throwing toys etc. I don't own a full length mirror and id love a chic style one for my bedroom. If I'm honest a little insight on where to start and help along the way would be amazing for me. Thank you very much for this chance and I wish everyone the best of luck. 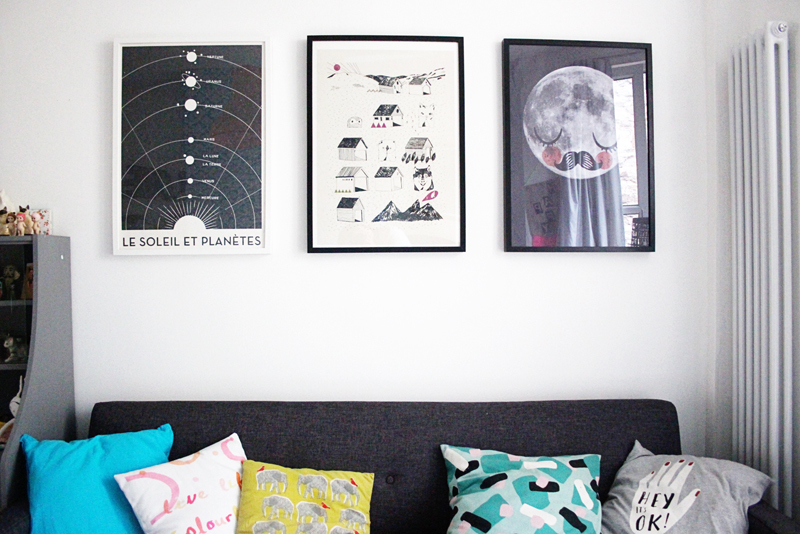 I'd love to have my 3 kids bedrooms looking lovely. They all have mismatched furniture and fittings but the two older ones are teens so I think it's important now for them to have a tip top space for them and their friends. Love what you have done... you make it look so easy even when it undoubtedly wasn't. I would love the team to work there magic on my sons room. His room is small so space saving is a necessity. Two things... A dresser for my lounge and a new bed. My bed is so old and I'd love to get a new one that doesn't make my bones creak ha!